Books are among my favorite gifts to give and receive. I especially like books that teach children about the importance of preserving nature, in a fashion they can relate to and understand. Hannah and the Talking Tree by Elke Weiss is a sweet tale of a little girl with giant ears. She gets made fun of for being different and retreats into nature to seek comfort. Here she meets a talking tree who tells her he is threatened by people who want to cut him down. Hannah befriends the tree and eventually makes her way back to the city to urge others to save the tree. I won't give away the happy ending! This book features vibrant, adorable illustrations of animals and nature, and the simple language makes it easy for children as young as three years old to appreciate and comprehend. 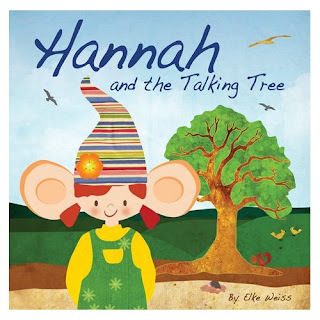 If you're looking for a charming, green tale for a teeny greenie in your life, Hannah and the Talking Tree is sure to delight. Further, this book is printed on recycled, FSC certified paper from responsible sources.